It hides in your mouth, destroying gum tissue and teeth, and it can lead to strokes, heart attacks, and pregnancy complications. Don’t think it’s your problem? Conservative estimates report that up to 80 percent of the population unknowingly has gum disease in some form.Seventy percent of adult tooth loss is attributed to gum disease. Recent research shows a link between patients who have gum disease and those who suffer from strokes, heart attacks, or complications with diabetes or pregnancy. 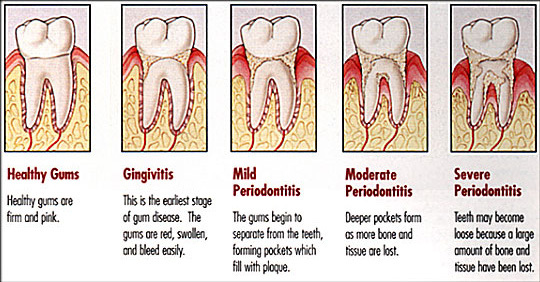 Gum disease is silent in that early symptoms may be painless and mild, like swollen gums or bleeding while brushing. Regular dental check ups are vital because a professional can detect, treat, and reverse gum disease in early stages before major problems arise. Learn more about gum disease treatment from experienced dentist Dr. Jean-Jacques Edderai. Regular dental visits with Dr. Edderai (a skilled dentist Miami patients trust with their dental healthcare needs) at least every six months allow us to keep a watchful eye on the health of your gums. You should also brush twice a day, floss once a day, and use good mouth rinses at home. We will recommend the products that will optimize your oral homecare, and we can also show you the best methods for brushing and flossing. If you have overcome periodontal disease, we will recommend frequent checkups to ensure your mouth stays healthy for a lifetime. Our periodontics patients come to us from Miami, Bal Harbour, Aventura, Ft. Lauderdale, Hollywood, Miami Beach and North Miami Beach.